Click to enlarge, or click here for PDF. This map assumes other lines are operating around the Bay Area, but that map will have to wait for another time. Let’s say for a minute the Interurban hadn’t stopped running in 1941. It was bleeding money, but its parent company, NWP, was a for-profit entity. What if the Interurban had somehow survived? For the sake of this exercise, I’m taking a few liberties. First, that the Bay Area had valued its rail transportation system from the 30s to the present, but had consolidated it all, as well as the Golden Gate Bridge, under the single umbrella of the MTC. Second, that European best practices had been implemented at least in this corner of the country. Third, that the Interurban could now survive on a 50% subsidy. And fourth, that Marin and Sonoma have their current populations, though with less sprawl. Though I had originally intended for this to be a bit more a light post rather than something more data-driven, a Twitter conversation with Dan Lyke motivated me to put some numbers behind the costs of an Interurban. Costs per vehicle-kilometer (vkm) vary widely based on the system. Vancouver’s automated Skytrain system costs $2.18/vkm, BART costs around $3.50/vkm, and New York’s subway costs $5.81/vkm. Using quite a few assumptions, I get an average annual operating cost between $43.2 million and $111.6 million. If we assume an average fare of $2.50 and a 50% farebox recovery rate, total ridership would need to be between 8.6 million per year, roughly the same number of transit trips on today’s GGT system, and 22.3 million. With the Geary and North Beach extensions (Muni’s 38-Geary alone carries over 13 million weekday passengers per year), it’s entirely feasible for the system to meet BART’s 80% farebox recovery. Alas, reconstructing the system would be prohibitively expensive and politically impossible. Large portions of some major roads (Sir Francis Drake Boulevard, Fourth and Third Streets, Magnolia Avenue, Miller Avenue, and others) would need to be converted back to rail, wealthy homeowners would need to accept trains running behind their back yards, Sausalito would need to take a new elevated railway along the waterfront, Geary and North Beach would need to be torn up for a new subway, and over $10 billion would need to be spent. While the San Francisco part of the project might be worth it, for 8 million riders per year, most of them already served by transit, the cost and pain of the Marin Interurban simply wouldn’t be worth it. This map, along with all my other Interurban maps, is posted in my photo gallery. The post originally appeared on The Greater Marin. The 1930's in general was a destructive time for railroads and transit systems. The growth of autos/trucks combined with the effects of the great depression meant doom for a lot of systems. Good question why the architects didn't include a double deck for the existing transit system in the North Bay. The FDR administration was certainly willing to lend credit for such projects, as the two bay bridges attest along with the hundreds of other New Deal projects they built in the Bay Area. While thinking about the "what ifs" on the SF side, it suddenly dawned on me that one could justify assuming higher population and less sprawl had the NWP stayed open. The current growth patterns reflect stunted growth, like Corte Madera moving its whole center of gravity to mall-and-sprawl by the freeway. Stuff like that might not have happened to such an extreme extent with the trains still running - certainly the total abandonment of those quaint young downtowns wouldn't have happened. The zoning plans and growth-limits would look different; Marin could easily have been on the leading edge of "transit oriented" and "smart growth" planning back in the 70s and then you'd have WAY more potential ridership now. Something to think about in a "what if" scenario. NWP linked up with SP? Mind blown. It would've presented the possibility of through-running Caltrain up to the North Bay and obviated the whole downtown extension debate. Great, now I want to research analog lines in NYC to find out what happened to them to see what could have happened here. Quite a bit more likely. I hadn't known about the existing San Francisco infrastructure, and you're right that it makes more sense than tunneling, at least for the northern alignment. I chose the Geary and Columbia alignments because they were top prospects for the BART Marin line, with plans eventually settling on Geary. But a subway under Geary has been in all the subway concepts I've seen going back to the 1930s. 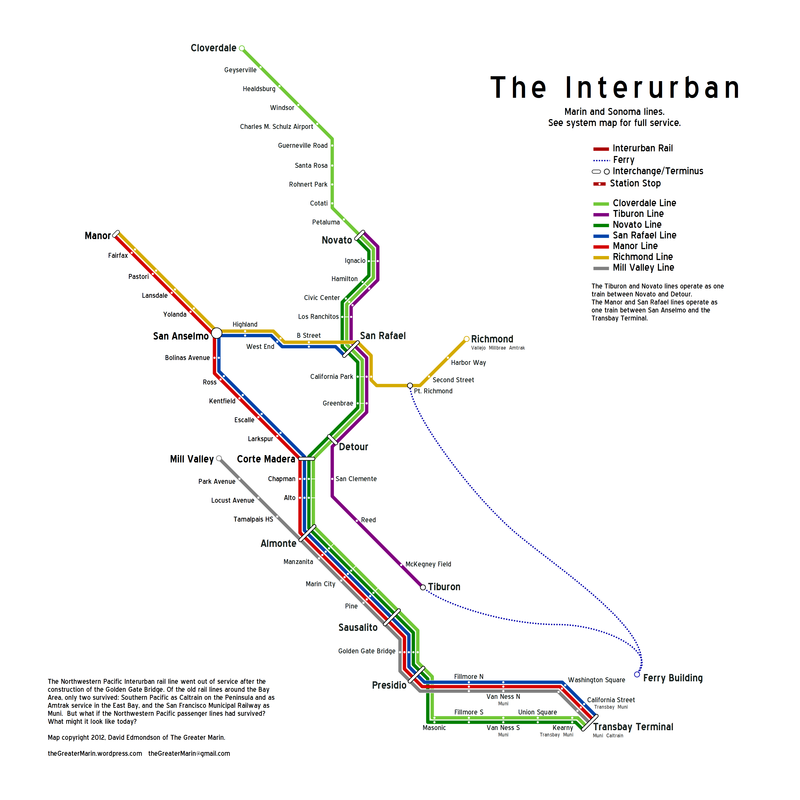 If the Bay Area had been serious enough about rail to keep the Interurban from going under, SF probably would've used the excuse to build that subway and interline the B-Geary with the Interurban. Only real issue I can think of is that two lines in SF wouldn't pay. Had the tracks gone across the GG bridge, I'd guess probably they'd have come down right there at Presidio and run along the shoreline through the Marina and then past the piers to Embarcadero - the ROW to Embarcadero was already there from the old Presidio branch line, with minimal surface traffic interference at least as far as the piers. SF had infrastructure in place at Embarcadero that had been handling East Bay commuters and was ready to be used, so it was all right there for the taking. As a practical matter, it seems more likely to me than the massive tunneling under built-up areas that a Geary or California routing would have required.